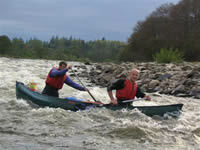 This memorable five day river trip is without question a life enhancing experience. In light of the team work required to prepare, engage and complete this event is can be an effective, challenging team exercise. 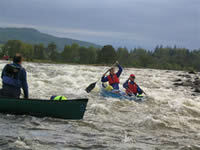 It involves overnight camps and an opportunity to become steeped in nature at it very best whatever the weather! 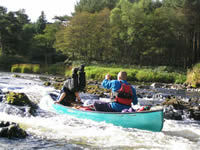 Paddle an open-canoe for almost 70 miles of this most beautiful of Scottish rivers, at a leisurely pace through five unforgettable days. Suitable for all standards of paddler, from novice upwards, the adventure begins in the Highland village of Newtonmore, where the first and second evenings and overnights will be spent in our comfortable Victorian home..
Day 1 ~Basic paddle strokes will be learned/revised on the flat waters of the Spey just downstream of Kincraig Bridge. 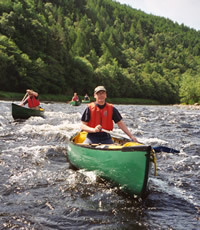 Then, at a leisurely pace, the group will set off to tackle a series of small but fun rapids en route to Aviemore, travelling through historic Rothiemurchus Estate, filled with stories central to the history of Clan Grant. Return to Newtonmore for another night of comfort at The Beeches. Day 2 ~Minibus takes us back to where we stopped on Day 1. We move off on to a mixture of small, easy rapids and flat sections taking us on past Boat of Garten and Monarch of the Glen’s ‘Glenbogle’ Station near Broomhill Bridge. Stopping for our first night under ‘canvas’ at the picturesque riverside camping meadow (access to hot water here!) at Balliefurth, upstream of Grantown on Spey. 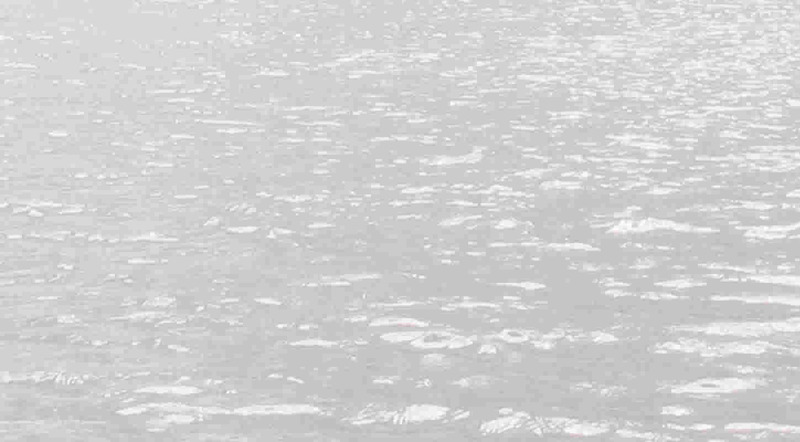 Note : Day 1 and 2 can be combined if paddlers are experienced. Day 3~ The river starts to flow more decidedly seaward as it passes Grantown on Spey and Cromdale, to our next overnight stop at Blacksboat, upstream of Aberlour.Day 3 ~ The river starts to flow more decidedly seaward as it passes Grantown on Spey, with its fun, boulder strewn rapids and on by Cromdale. Through Tulchan and Ballindalloch estates and some bigger rapids to our next overnight stop at Ballindalloch Station, by Cragganmore, part of the Speyside Way long distance walk. Day 4~ On into the area of famous malt whisky names such as Knockando & Tamdhu, to Aberlour where, since we have fewer miles to travel today on still faster water(! ), we might, if you choose, have a stop for *afternoon tea/lunch. Overnight camp in Craigellachie, at a spot close to where the River Fiddich leaves its famous glen and adds its waters to the Spey. As a last night treat award yourselves a relaxing, tasty *bar-meal in the village’s Highlander Inn and maybe a dram with Joe in the unique Fiddichside Inn. Day 5~ After passing the village of Rothes, moving through steep forested banks and by red cliffs and pillars, the river takes us on to Fochabers, heralding our approach to the coast. With now shingle banks either side one can smell the sea air, see ospreys on river patrol ~ perhaps even witness otters at play. Finally, in completing your memorable journey, paddle towards the rolling waves of remote Spey Bay, where ‘the fresh meets the salt’. Join with us on this magical journey. 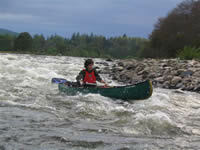 Develop new skills and awareness, of how to handle this versatile craft, thus enhancing competence and confidence. The ‘Classic’ 5 Day Descent is ideal for families. 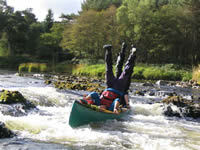 Award yourself the pleasure of being steeped in nature and experience immense personal satisfaction in guiding, normally with a partner, your canoe through some of the most beautiful countryside in Britain, along Scotland’s most ideal touring river. A bird-watchers’ paradise, with dippers, golden-eye and grey wagtails at your elbow and buzzards soaring above.